Congratulations to Jeremy Elwood! Jeremy was the winner for the Open House drawing. 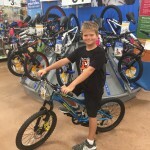 Enjoy your new bike!